Sit back and enjoy this video by photographer Radim Schreiber, who manages to capture the true beauty and magic of North American lightningbugs on a summer night. Who’d Want to Eat a Firefly? Take a walk on the Dark Side – meet some dangerous predators that lurk in the Great Smoky Mountains. We discovered a surprising link between firefly males’ gift-giving habits and whether or not their females can fly. The Fireflyer Companion (pdf) Until Silent Sparks, not much firefly information has been popularly available. But during the mid-1990s firefly expert Jim Lloyd mailed out this informal newsletter that’s brimming with firefly facts, poems, crossword puzzles, and random musings. 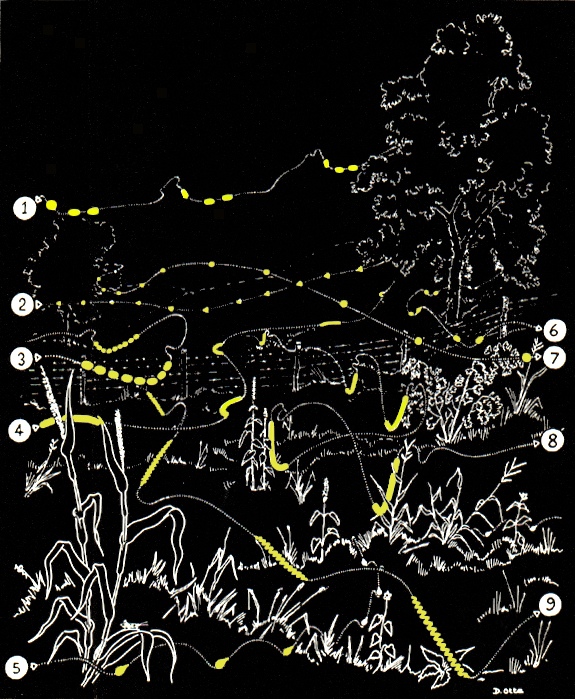 Studies on Firefly Flash Communication (pdf) Jim Lloyd’s doctoral thesis focuses on North American Photinus fireflies – here he describes their geographic and habitat distribution, courtship flash behavior, and more.